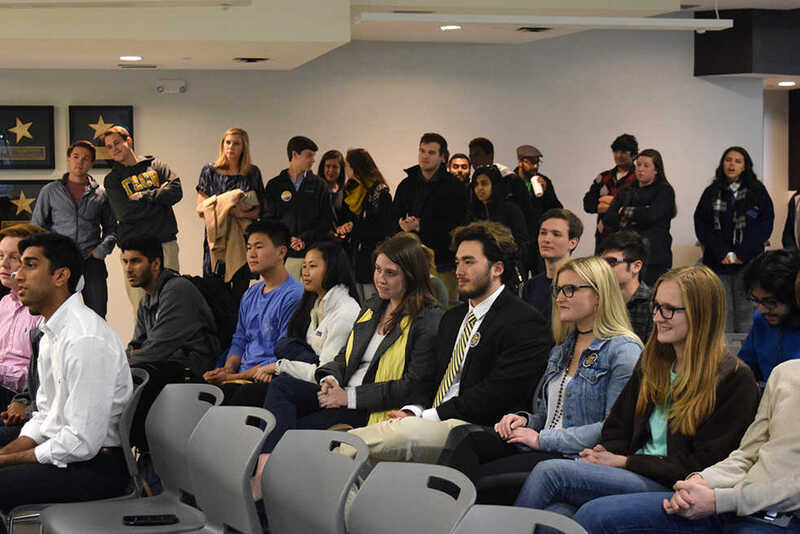 This year’s race for Undergraduate Student Government president and executive vice president has ended in a runoff between Sujay Peramanu/Richard Wang and Lizzie Lisenby/Connor Brogan. Of the 3258 ballots cast, Peramanu and Wang received 1232 votes, followed by Lisenby and Brogan with 1040 votes. Leanne Francis and Apollo Liu trailed in last with only 985 votes. “I feel thankful to have another opportunity to serve students and I feel thankful to have another shot at this. [I’m] looking forward to the runoff,” Lisenby said. “Both of us were physically shaking when they said our name. It was honestly just the most incredible moment,” Brogan added. The runoff election between the two candidates will take place during the week following Spring Break, from March 27 to March 30. No further campaigning will be permitted during the official school holiday. All three campaign teams were hit with election violations. Peramanu and Wang had a budget reduction of 2% for the minor violation of having their website up 24 hours prior to the official start of campaigning. No votes were deemed to be compromised. Both the Lisenby/Brogran and Francis/Liu tickets faced major violations. UJC, who handles most major violations, sanctioned Leanne and Apollo with a budget reduction of 2% for campaigning in the SGA three times, meaning that they used SGA office as a meeting space and/or having campaign materials out. This was deemed a major violation due to the number of incidents, but no votes were believed to be compromised due to when the incidents occurred. Lizzie and Connor were sanctioned for “[abusing] organization connections and their policies”. by posting in several Institute-mandated groups, including FASET and ORGT, about voting for their team. This is a violation of Institute policy and thus, was deemed a major violation by the Election Committee. Due to Lizzie’s affiliation with UJC, the Election Committee decided to waive the policy regarding UJC overseeing major violations and heard the violation themselves. After discussion, the group sanctioned the team with vote reduction of 3%, a reduction that would normally accompany minor violation. This marks the second consecutive year that the executive elections have gone into a runoff, with last year’s runoff taking place between Nagela Nukuna/Shane Mudrinich and Anju Suresh/Ben Nickel. In that initial election, the tickets were separated by only four votes before Nukuna and Mudrinch won the runoff which took place the following week.